Even in a bigger venue, Andy Thomas, choir director at Whiteaker Middle School, decided on two nights for the annual Cabaret show. And that decision has paid off as the first performance, Thursday, Feb. 23, has already sold out. The second show is Friday, Feb. 24. Both performances begin at 7 p.m. at Salem Alliance Church, 555 Gaines St. NE, Salem. Tickets, which include admission to the show, dessert and entry into raffle drawings, are $10 and available at the Whiteaker main office. The cabaret, which along with singing, also includes acting, dancing and lighting effects, is a fundraiser for the Whiteaker choir. Half the money goes to future choir trips and the other half to music, supplies and scholarships. The theme for this year’s show is musical theater. 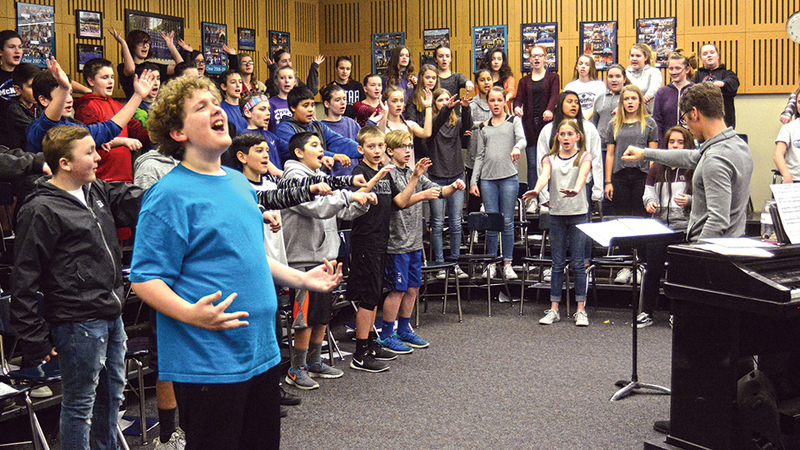 “It’s big and fun and so exciting having so many people there and getting to put on these big shows,” said eighth grader Bethany Dunegan, who is most looking forward to an Aladdin medley. Whiteaker eighth grader Elise Myers said her favorite is Wicked. “It’s really dramatic and dark,” she said. Along with Aladdin and Wicked, the choir is also performing songs from Annie and a collection from different pirate musicals. Thomas has 200 students in his six choirs that will perform on both nights. During Wicked, the McNary Highlanders Classics will also join in. “We’re trying to create a nice connection, bridging the kids from middle school to high school,” Thomas said. Performing in front of so many people is a confidence booster for the middle schoolers. “You go up in front of a thousand people in the audience and you’re in middle school and you perform and the audience is clapping and going crazy, what that does for them personally, especially in middle school is exponentially more than any other level because they’re so developmentally going through so much and they’re more self conscious,” Thomas said.